It is not the responsibility of knights errant to discover whether the afflicted, the enchained and the oppressed whom they encounter on the road are reduced to these circumstances and suffer this distress for their vices, or for their virtues: the knight’s sole responsibility is to succour them as people in need, having eyes only for their sufferings, not for their misdeeds. They brought it on themselves we say as if it matters. Of course it’s often true – regarding others, regarding me. But the very statement reveals a blindness of the heart that replaces compassion with blame and shame. They brought it on themselves. Who hasn’t? Who among us doesn’t contribute to a significant portion of our own suffering? Am I less in need of compassion because I’ve been the root of my own troubles? Am I somehow more worthy of God’s unmerited favor if some wrong has been done to me rather than by me? We have a reputation, we who call ourselves Christian people, religious people, spiritual people. We’ve garnered our fame in much the same vein as Don Quixote. So certain of our truth, our headlines and sermons and personal encounters are too often filled with an almost fervid insanity as we go about tilting at windmills. We, who have knighted ourselves in our own faith, justify wars of weapons and words waged upon those whose convictions and vices vary from our own. Cultural wars, denominational wars, political recriminations, all carried out, so we claim, in service of our King. If this were, in fact, true – then the King is sending some very mixed messages. It serves a certain purpose to vilify those with whom we fundamentally, or sometimes even superficially differ. It proffers both provocation and justification. Sometimes in light of a personal attack or an attack on my belief system or an attack on someone I love – sometimes I respond by turning the other cheek. Without guile or defensiveness I wish only for light and peace and grace for the other. Sometimes. Sometimes I remain in a state of grace. Sometimes not. How can we, who are the benefactors of God’s irresistible grace which binds our wandering hearts to Him, offer anything other than The Good News, grace without merit in return? How is it possible that we can be supplicants of God’s unmerited favor one moment and turn His words into a weapons the next? When the suffering run from us rather than to us, perhaps it’s because we’ve forgotten our calling to live compassionate lives that succor rather than scourge the wounded. Reblogged this on guam ~ in'. I know that I have myself, hurt many, many with my words – and painfully, the offended glare or verbally attack back how I could have said what I did when I’m supposed to be a Christian. Thank you for this post, Debbie. It’s so tough to be a person who actually shares and becomes a channel of the immense fountain of grace that we receive, for sure. But by God’s grace and Word, we can grow little by little to become grace-givers while on this earth. How wonderful to get my two minutes of grace AND compassion again! And boy, just in time! Have something going on that so needs compassion and reminds me of what word God gave me for the year . . .mercy. Somehow we just aren’t taught to not give people what they deserve. Praying for God to rewrite His ways of compassion, mercy and grace on my heart today! Thank you, gracious one, and God bless! I wonder if there are two ideas more foreign to our ‘natural’ minds than grace and mercy? We don’t like the idea of giving something for nothing or of someone else getting something for nothing! I will pray your prayer with you and ask you to to pray it for me as well! Timely, for my world, and spot on! “Sometimes I remain in a state of grace. Sometimes not.” I was there recently. Received the reverberations, last week, from something I’d said at a belated Christmas dinner with “family”. Sometimes my mouth still gets ahead of my heart, my brain, and my recovery. It was a 14 year old resentment I let out of the jar. After speaking with my sponsor about it, she said she wished she had “soul wound spray in a bottle”. I could have used some, for both the person I hurt, and myself. After years of “thinking” I was compassionate, accepting and forgiving of the person, I’d forgotten to be equally compassionate of that person’s extended family. I can’t control the ripple in the pond after I let go of the stone, but I sure can control not letting go of the stone. Thank you for your contributions online. Your ripple is such a perfect example. Thank you for sharing your experience with us. And now it’s time (and perhaps you have already) to extend that same grace to yourself that you tenderly desire to offer others! 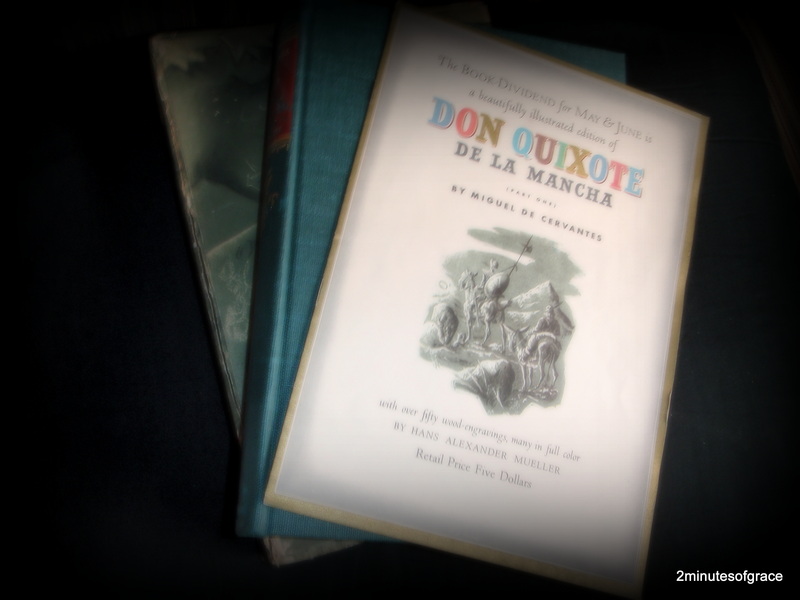 I’ve never read Don Quixote, but that quote is brilliant! So true, Debbie, so true! I had never heard it either… Yes tis so brilliant . I did wade through the book a number of years ago (the English translation, not the original Spanish) and I enjoyed it. I’ve always loved this particular quote. You might like the movie adaptation. There have been more than one. I’ll have to look for that one. I’m a fan of Lithgow. “When the suffering run from us rather than to us, perhaps it’s because we’ve forgotten our calling to live compassionate lives that succor rather than scourge the wounded.” Just wanted to make that point again. Much of your post is very quotable. This is just spot on, Debbie! Thank you. Thanks, Heidi! Now praying to practice my preaching. So good to hear from your heart Debbie! Very well said. I was immediately choked up. I was of the subconscious belief that if you made a mess you had to dig your own way out of it. Receiving love and grace was hard. I didn’t deserve it. Oh how I have been in that judgment place for too long BUT if it weren’t for the mess I wouldn’t have seen it. The “mess” was the gift allowing me to see the magnitude of love and grace given me. Like the heroine addict receiving the meds to help him. I recently watched a live feed of a conference of a group of people that were being demonstrated against outside with horrible signs and verbal messages but their response to these people was amazing. Pure kindness. One of the speakers had said something that was so simple when encountering the opposition / enemies but yet the results were so profound. We’ve all heard it over and over simply …..listen. I have a long ways to go … I’m listening to Him … and He just wants my heart. Cathy – I’m trying to remember the idiom I grew up with. I believe it was something like “You’ve made your bed, now you have to lie in it”. Eventually the meanings became clear – particularly the message that there was no place for compassion or pity for those who caused their own troubles. That certainly isn’t the message of Jesus and it isn’t the message of grace. Yes! Listen more, say less is a lesson I’m learning along with you! “Compassion should be our default setting”. I like this. I would say that so much of my suffering, difficulties, etc could be traced to bad decisions. Grateful for those in my life who offer grace. You were that person for me, Gaye. I’m forever grateful for your grace and compassion when I was the most broken and vulnerable. Thank you. Thanks again…always look forward to your wisdom and am not disappointed! I’ve been away from writing for a long time – thank you, Carol, for reading and for your kind support! Great post from Two Minutes of Grace – a reminder that compassion should be our default setting. Ruth – Oh how interesting. I was unaware of this particular controversy. I’m glad your governor chose compassion. Sadly it isn’t always the popular choice, is it? Two Minutes of Grace Blog at WordPress.com.